David Attenborough has had, and continues to have, a remarkable career making documentaries about the natural world. To this end, he has inspired generations of biologists. We were very pleased when he turned his attention to amphibians and reptiles for the making of the series Life in Cold Blood. And we were particularly happy when he chose to include the Augrabies flat lizard (Platysaurus broadleyi). Martin Whiting, Scott Keogh and Phil Byrne were privileged to spend time with David in the field at Augrabies Falls National Park in South Africa where the BBC filmed Augrabies flat lizards in action. Flat lizards feature in the episode Dragons of the Dry and are shown performing incredible 360 degree aerial flips while catching flies. This footage propelled them to stardom and we think it’s only fitting to name a new species of flat lizard (very closely related to the Augrabies flat lizard) in his honour. 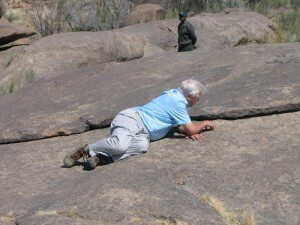 David Attenborough in the field surrounded by flat lizards at Augrabies Falls National Park. 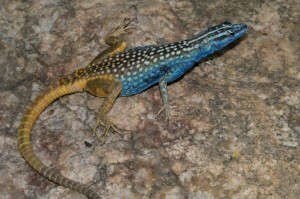 We describe a new species of flat lizard (Platysaurus attenboroughi sp. nov.) from the Richtersveld of the Northern Cape Province of South Africa and the Fish River Canyon region of southern Namibia. This species was formerly confused with P. capensis from the Kamiesberg region of Namaqualand, South Africa. Genetic analysis based on one mtDNA and two nDNA loci found Platysaurus attenboroughi sp. nov. to be genetically divergent from P. capensis and these species can also be differentiated by a number of scalation characters, coloration and their allopatric distributions. To stabilize the taxonomy the type locality of Platysaurus capensis A. Smith 1844 is restricted to the Kamiesberg region, Namaqualand, Northern Cape Province, South Africa.